Add clove, cinnamon, cardamom & bay leaves. Stir. Add onion & 1/2 tsp salt fry till onion turns light golden brown. Add turmeric, ginger paste, garlic paste & green chilly. Fry till raw smell goes. Add tomato stir & close the lid, cook for 5 min. Add cumin powder, coriander powder, & red chilly powder. Stir. Stir in between & till water evaporates completely. Add coriander & powder kasturi methi using your palm before adding, sauté for 5 sec. Add lemon juice, mix & remove from the heat. 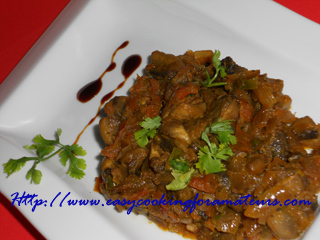 Mushroom stir fry is ready to serve with chapati, naan & rotis (Indian breads). I love mushrooms n this sounds n looks very very delicious! Delicious and spicy mushroom stir fry..looks very inviting. I love all mushrooms dishes & keep looking out for new recipes with it...This one is a sure keeper!!! This looks great! Will have to try. I can have this delicious mushroom stir fry with anything.. I think this is my first visit to your blog - Mushrooms sound and look yum-delicious! I have bookmarked this one, Madhura, and will be trying out...I love mushrooms and am fed up with the same old way I make them :-)...keep up the blogging!